You are here: Home / Sweepstakes & Giveaways / Win a Dream Vacation for 6! Expired: Win a Dream Vacation for 6! 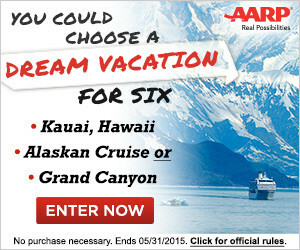 Win a Dream Vacation for 6 with AARP! The amazing options are Kauai, Hawaii, an Alaskan cruise or the Grand Canyon!